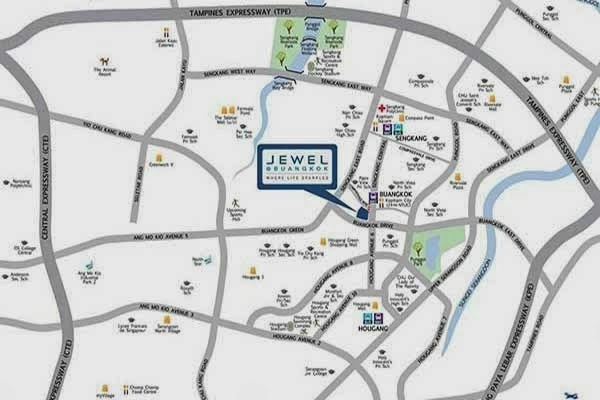 Jewel @ Buangkok is a high-end condominium estate that is located at the heart of Buangkok Drive, Singapore Disctrict 19. It is conveniently surrounded with top-shelf amenities that will cater to your every need. Spend leisure shopping sprees at Hougang Green Shopping Mall, Kang Kar Mall, and Compass Point which are all just nearby. You can enjoy brisk walking at the famous Punggol Park and Sengkang Riverside Park or better yet, delight yourself with the events and great performances at Hougang Stadium at your heart's content. You can just stroll around the district with MRT stations just nearby such as the famous Buangkok MRT and Hougang MRT. You may also have smooth driving experience the major roads and expressways such as the known Tampines Expressway (TPE) and Kailang Paya Lebar Expressway (KPE). Prominent schools are also established nearby to serve your family with a learning advancement that exceptionally plausible like the Serangon Junior college, Monfort Secondary, Palm View Primary School and a lot more! Where else can you find a resort-like residences that will serve you the best of fine living experience? Only here at Jewel @ Buangkok! View Jewel @ Buangkok Brochure for a feel of this development. Jewel @ Buangkok showflat is available for preview by appointment. You may call our hotline or choose to register using the form provided below.